Identify Desert Subterranean Termite Swarmer: These termites swarm during and after Monsoon season. Swarmers are a pale yellow-tan color, and measure about 3/8 of an inch in length. Swarmers heads are smaller than worker heads, like the one pictured below, but their coloring is the same, just add wings! 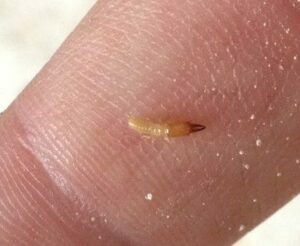 Swarming Termites have 2 wings of equal size that are translucent, and break off after swarming! Desert Subterranean Termites do their swarming at NIGHT, and then pair off to start new colonies. Desert Subterranean Termites, scientifically names Heterotermes aureus (Snyder), live throughout the Gila Desert in dead cactus, and other desert plants, but they can also cause severe damage to buildings. 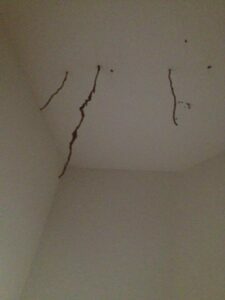 A common sign of a Desert Dubterranean Termite Infestation is MUD TUBES hanging down from a ceiling and sheetrock, or holes in drywall that are plugged with termite feces. Call for a FREE Termite Inspection! Providing Termite Control in Phoenix, Mesa, Glendale, Gilbert, Scottsdale, Chandler, Queen Creek, Maricopa AZ & surrounding areas.